Mass disconnects as the servers go down, via Rob Williams on YouTube. One of the earliest full 3D fantasy massively multiplayer online role-playing games going, Asheron’s Call and its sequel, Asheron’s Call 2, we’re shut down today as the games’ developer goes one way and its license goes another. So the players gathered, reuniting with old friends, going on one last run together before the worlds’ lights went out. The image atop this post is taken from a particularly dazzling final moments video from Rob Williams on YouTube, who managed to capture the vibrant glow of the mass forced disconnect. Sparta from YouTube’s The Uber Newbs streamed a more solitary farewell to the game, retreating to a tower as the servers went down. 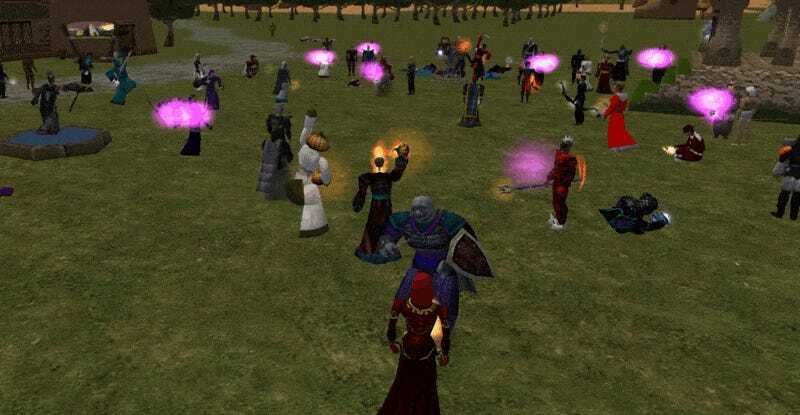 Some massively multiplayer games host huge, colorful events to mark their closing. Asheron’s Call, which saw its last content release in 2014, simply turned off. While most of the attention has been on the older, more popular original, Andrew and MJ of Massively Overpowered dual-streamed the final moments in both games. As for Julien, the 74-year-old grandfather who’s played Asheron’s Call since launch, I’ve been informed by Blizzard that he and his granddaughters have been hooked up with copies of World of Warcraft, a 12-year-old MMO, to keep him playing now that AC is no more.